Butterfly embroidery peel offs with glitter. 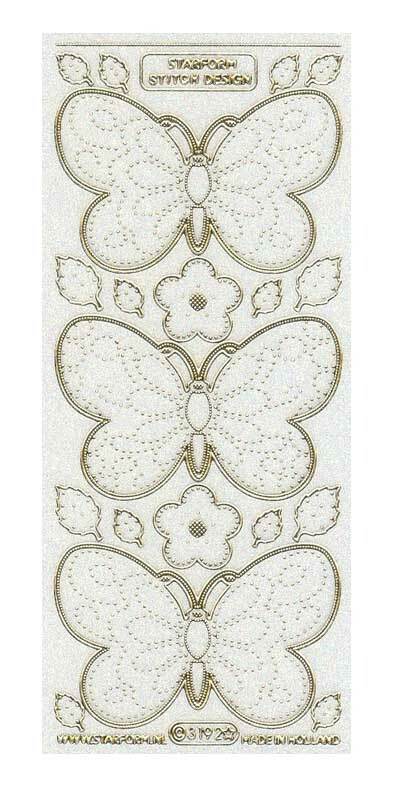 A 9" x 4" peel off sheet with self adhesive butterflies. The butterflies measure 9cm x 5.75cm and the sheet also has flowers and leaves. The peel offs have small dots which are used to sew thread and create coloured patterns. Perfect for adding a personal touch to greeting cards, scrapbooking, paper crafts and much more. Embroidery on paper is very easy to do. Stick the peel off to card and prick holes where indicated on the peel off, then attach thread to the back of the design with sticky tape and use the dots to guide your embroidery. Own Glitter Butterfly Embroidery Peel Off? Why not be the first to leave a review.